هاشمی, میرمسلم, عاشورنیا, مهدی, پناهنده, مریم. (1394). بررسی اثر استفاده از روش ازن‌زنی برای حذف سم بوتاکلر از آب، مطالعه موردی: آب‌های زیرزمینی استان گیلان. مجله آب و فاضلاب, 26(2), 114-123. میرمسلم هاشمی; مهدی عاشورنیا; مریم پناهنده. "بررسی اثر استفاده از روش ازن‌زنی برای حذف سم بوتاکلر از آب، مطالعه موردی: آب‌های زیرزمینی استان گیلان". مجله آب و فاضلاب, 26, 2, 1394, 114-123. هاشمی, میرمسلم, عاشورنیا, مهدی, پناهنده, مریم. (1394). 'بررسی اثر استفاده از روش ازن‌زنی برای حذف سم بوتاکلر از آب، مطالعه موردی: آب‌های زیرزمینی استان گیلان', مجله آب و فاضلاب, 26(2), pp. 114-123. هاشمی, میرمسلم, عاشورنیا, مهدی, پناهنده, مریم. بررسی اثر استفاده از روش ازن‌زنی برای حذف سم بوتاکلر از آب، مطالعه موردی: آب‌های زیرزمینی استان گیلان. مجله آب و فاضلاب, 1394; 26(2): 114-123. 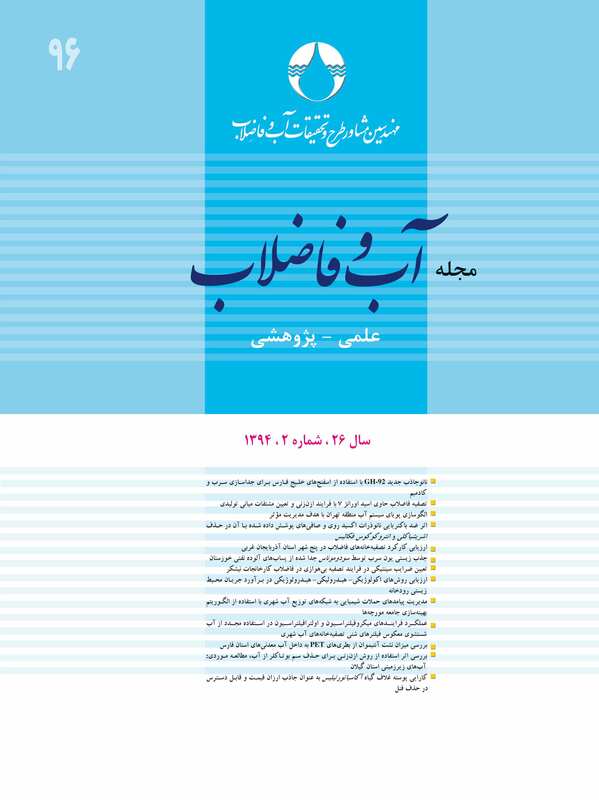 در منابع آبی استان گیلان، مقدار زیادی از علف‌کش‌ها (بوتاکلر) به‌دلیل استفاده بی‌رویه از کودهای شیمیایی برای افزایش محصول در مزارع برنج وارد آب می‌شود. در این پژوهش اثرات ازن‌زنی برای حذف سم بوتاکلر باقیمانده از آب بررسی شد. نمونه‌ها در طی چهار فصل از 20 چاه منتخب جمع‌آوری شد و پس از تثبیت پارامترهای فیزیکوشیمیایی با استفاده از سیستم استخراج مایع و کروماتوگرافی گازی آنالیز شدند. اندازه‌گیری‌های کمّی با روش افزایش استاندارد انجام شد و برای بررسی روش‌های حذف از دستگاه مولد ازن استفاده شد. برای بررسی‌های آماری نیز از نرم‌افزار SPSS بهره گرفته شد. مطابقنتایجبه‌دستآمده،غلظتباقیماندهبوتاکلر درنمونه‌هایآنالیزشدهبالاترازحد استانداردهایجهانیبه‌دستنیامد. دربررسیروش حذف، تأثیر پارامترهایدما،سختیوpH مطالعهشد و مشخص شد که در آب‌هایی باpH قلیایی و دمای بالا، راندمان حذف بوتاکلر به‌روش ازن‌زنی افزایش می‌یابد و این در حالی است که با افزایش سختی، این راندمان کاهش می‌یابد. همچنین در بررسی حاضر از مدل سینتیکی شبه نوع اول، برای بررسی نرخ تماس ازن با بوتاکلر استفاده شد و با توجه به نتایج به‌دست آمده مشخص شد که حاصلضرب غلظت ازن در مدت زمان تماس، با لگاریتم میزان بوتاکلر رابطه خطی و غیرمستقیم دارد. Rice is an important staple food in most parts of the world. The water resources in Guilan Province are receiving large quantities of herbicides (butachlor) due to the vast rice fields in the province and the indiscriminate use of chemical fertilizers for increased harvest. The present study investigates the effects of ozone used for removing the remaining butachlor from groundwater. Samples were collected from 20 wells during four seasons and their physicochemical parameters were analyzed using gas chromatography and liquid extraction after their fixation. Quantitative measurements were performed using the standard enhancement method and removal methods were evaluated using an ozone generator. The results were subjected to statistical analysis using the SPSS software. The results showed that the residual concentration of butachlor in the samples was not above the recommended international limits. The effects of temperature, hardness, and pH were investigated to determine the efficiency of the removal method used and it was found that the butachlor removal efficiency of ozonation was higher in waters with an alkaline pH and high temperatures, while it decreased with increasing hardness. The pseudo-first order kinetic model was used to investigate the rate of ozone to butachlor contact to find that the product of ozone concentration by contact time had a linear and indirect relationship with the logarithm of the butachlor content. Adeyeye, A., and Osibanjo, O. (1999). “Residues of organochlorine pesticides in fruits, vegetables and tubers from Nigerian markets.” J. of the Science of the Total Environment, 231, 227-233. Deng, L., Qu, H.M., Huang, R.K., Yang, Y.Z., Zheng, X.B., and Wang, H.Y. (2003). “Survey of food poisoning by organosphorus pesticide at an employee refectory.” J. of Practical Preventive Medicine, 10, 766-767. Li, X.H. (2002). “Analysis of food poisoning due to taking vegetable contaminated with organophosphorus pesticide.” J. of China Tropical Medicine, 2(4), 519. Kumari, N., Narayan, O.P., and Rai, L.C. (2009). “Understanding bu-tachlor toxicity inAulosira fertilissimausing physiological, biochemical and proteomic approaches.” J. of Chemosphere, 77, 1501-1507. Debnath, A., Das, A.C., and Mukherjee, D. (2002). “Persistence and effect of butachlor and basalin on the activities of phosphate solubilizing microorganisms in wetland rice soil.” J. of Bulletin of Environmental Contamination and Toxicology, 68, 766-777. Xu, D., Xu, Z., Zhu, S., Cao, Y., Wang, Y., Du, X., Gu, Q., and Li, F. (2005). “Adsorption behavior of herbicide butachlor on typical soils in China and humic acids from the soil samples.” J. of Colloid. Interf. Sci., 285, 27-32. Suseel, M.R. (2001). “Effect of butachlor on growth and nitrogen fixation byAnabaena sphaerica.” J. of Environmental Biology, 22, 201-203. Min, H., Ye, Y.F., Chen, Z.Y., Wu, W.X., and Du, Y.F. (2002). “Effects of butachlor on microbial enzyme activities in paddy soil.” J. of Environmental Sciences, 14(3), 413-417. Chen, Y.C., Katherinebanks, M., and Paulschwab, A. (2003). “Pyrene degradation in the rhizosphere of Tall Fescue (Festuca arundinacea) and Switchgrass (Panicum virgatum L).” J. of Environmental Science and Technology, 37, 5778-5782. Junghans, M., Backhaus, T., Faust, M., Scholze, M., and Grimme, L.H. (2003). “Predictability of combined effects of eight chloroacetanilide herbicides on algal reproduction.” J. of Pest Management Science, 59, 1101-1110. Farah, M.A., Ateeq, B., Ali, M.N., Sabir, R., and Ahmad, W. (2004), “Studies on lethal concentrations and toxicity stress of some xenobiotics on aquatic organisms.” J. of Chemosphere, 55, 257-265. Senseman, S.A. (2007). Herbicide handbook, Weed Science Society of America, Lawrence. Bowen, G.D., and Rovira, A.D. (1991). “The rhizosphere.” Waisel, Y., Eshel, A., and Kafkafi, U., (Eds. ( Plant roots-the hidden half, Marcel Dekker Inc., New York. 641-661. Turpault, M.P., Gobran, G.R., and Bonnaud, P. (2007). “Temporal variations of rhizosphere and bulk soil chemistry in a Douglas fir stand.” J. of Geoderma, 137, 490-496. Ye, C.M., Wang, X.J., and Zheng, H.H. ( 2002). “Biodegradation of acetanilide herbicides acetochlor and butachlor in soil.” J. of Environmental Sciences, 14(4), 524-529. Chen, W.C., Yen, J.H., Chang, C.S., and Wang, Y.S. (2009), “Effects of herbicide butachlor on soil microorganisms and on nitrogen-fixing abilities in paddy soil.” J .of Ecotoxicology and Environmental Safety, 72, 120-127. Ateeq, B., Farsh, M.A., and Ahmad, W. (2005). “Detection of DNA damage by alkaline single cell gel electrophoresis in 2, 4-dichlorophenox-yacetic-acid and butachlor-exposed erythrocytes of Clarias batrachus.” J. of Ecotoxicol Environ. Saf., 62, 348-354. Geng, B.R., Yao, D., and Xue, Q.Q. (2005b). “Genotoxicity of pesticide dichlorvos and herbicide butachlor in Rhacophorus megaceph-alus tadpoles.” J. of Acta Zool Sin, 51, 447-454. Panneerselvam, N., Sinha, S., and Shanmugam, G. (1999). “Butachlor is cytotoxic and clastogenic and induces apoptosis in mammalian cells.” Indian J. of Exp. Biol., 37, 888-892. Hsu, K.Y., Lin, H.J., Lin, J.K., Kuo, W.S., and Ou, Y.H. (2005). “Mutagenicity study of butachlor and its metabolites using Salmonella typhimurium.” J. of Microbiol Immunol Infect, 38, 409-416. Tilak, K.S., Veeraiah, K., Bhaskara Thathaji, P., and Butchiram, M.S. (2007), “Toxicity studies of butachlor to the freshwater fish Channapunctata (Bloch).” J. of Environ. Biol., 28, 485-487. Kamel, F. (2003). “Neurobehavioral performance and work experience in floride framevorkers.” J. ofEnvironmental Health Perspectives, 111, 1765-1772. Fishel, F.M. (2004). Evaluation of pesticides for carcinogenic potential, University of Florida, Institute of Food and Agricultural Services (IFAS), USA. EPA. (2000). Summary of pesticide removal, transformation efficiencies from various drinking watertreatment proeesses, Prepared for the Commiltee to Advise on Reassessment and Transition (CARAT) <http://www.EPA. gor/oppfead1/cafat/>. (Octorber, 3, 2007). Soleimani, P., and Amini-Ranjbar, Gh.R. (2004). “GC/MS analysis of fenitrothion and butachlor in Anzali wetland water.” J. of Research and Constructiveness, 65, 8-15. Brillas, E., Calpe, J.C., and Calbot, P.L. (2003). “Degradation of herbicide of 2, 4-dichlorophenoxyacetic acid by ozonation catalyzed with Fe and UVA light.” J. of Applied Catalysis B: Environmental, 46, 381-391. Benitez, F.J., Acero, J.L., Gonzalez, T., and García, J. (2001), “Ozonation and biodegradation process in batch reactors treating black table olive washing wastewater.” J. of Industrial Engineering and Chemistry Research, 40, 3144-3151. Ku, Y., Chang, J.L., Shen, Y.S., and Lin, S.Y. (1998). “Decomposition of diazinon in aqueous solution by ozonation.” J. of Water Research, 32(6(, 1957-1963. Ormad, M.P., Miguel, N., Claver, A., Matesanz, J.M., and Ovelleiro, J.L. (2007). “Pesticides removal in the process of drinking water production.” J. of Chemosphere, 71, 97-106. J. of Ozone Science and Engineering, 11, 339-382. David, C.C., Yao, and Haag, W.R. (1991). “Rate constants for direct reactions of ozone with several drinking water contaminants.” J. of Wat. Res., 25, (7), 751-773. Miltner, R.J., Baker, D.B., Speth, T.F., and Fronk. C.A. (1989). “Treatment of seasonal pesticides in surface waters.” J. of AWWA, 81, 43-52. United States Environmental Protection Agency. (2001). The Incorporation of water treatment effects on pesticide removal and transformation in food quality protection act (FQPA) drinking water, USEPA, USA. Tahmasseb, L.A., Nelieu, S., Kerhoas, L., and Einhorn, J. (2002). “Ozonation of chlorophenylurea pesticides in water: reaction monitoring and degradation pathways.” J. of the Science of the Total Environment, 291, 33-44. Salama, A.K., and Osman, Kh.A. (2013). “Remediation of pesticide-polluted water using ozonation as a safe method.” Global J. of Human Social Science, 13, 10-18.